Further details of Alexander Glen and Margaret Paul and the Old Boot Tavern. Jane Glen was the ninth of ten children born to Alexander Glen and Margaret Paul, who were married in December 1802 in Gorbals, Glasgow. Jane's birth is listed in the parish register for Glasgow on 13th June 1820, with her father's occupation listed as "vintner". Her father's address is listed in the Glasgow Directory of that year as 154 Trongate, and it would seem likely that this would be where the birth occurred. William Glen born on 16th October 1814. Father's occupation - ??? George Glen born 7th May 1818. Although two of these birth entries record Alexander Glen's occupation as a "weaver", his occupation in the Glasgow Directories of 1803 onwards is consistently listed as a "Spirit Dealer" or "Vintner". The addresses for his premises listed in the Directory vary from 1803-28, but after 1828 it remains 78 Saltmarket. The name of the tavern at 78 Saltmarket is listed from 1828 as "The Old Boot & French Horn Tavern", changing to "The Old Boot Tavern" post 1836. *This may be error in the street number, having been at 154 for the previous three years and returning to it thereafter. Also where a street number changes, this could just be a change in the numbering of the houses, and not necessarily a move of house. On 24th April 1840 Alexander Glen died, leaving an estate valued at £709 1s. 10p. (approx 34,165-00 today), and naming his eldest son, John Paul Glen, now a surgeon, as one of his executors. (For a transcript of Alexander Glen's Inventory and will - See Appendix E.) An announcement of his death appeared in the Glasgow Herald on 27 April that year. There is a record of an interment of an Alexander Glen, aged 66, in a lair in the Gorbals Cemetry on 1 May 1840 which may fit with the above. Alexander's wife Margaret Glen took over the running of the tavern, and it is there that we find her, with four of her children (including our Jane) and a grandson, for the census of 7th June 1841. 1841 Census (7th June) Glasgow (644/1) Book 21. Page 7. The Old Boot Tavern, 78 Saltmarket, Glasgow. 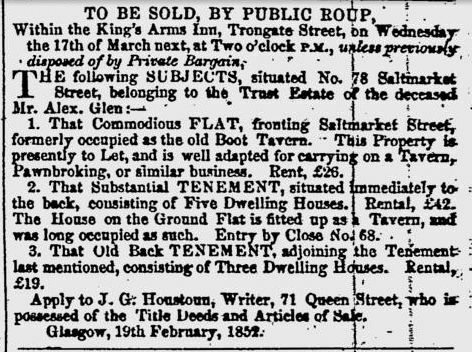 In the Glasgow Herald of 26 February 1844 an advert appeared offering the Old Boot Tavern at 78 Saltmarket to Let "....in consequence of the present tenant, Mrs. Glen, giving up the business." This was reflected by "Old Boot Tavern" disappearing from the Glasgow Directory after the 1844/45 edition. 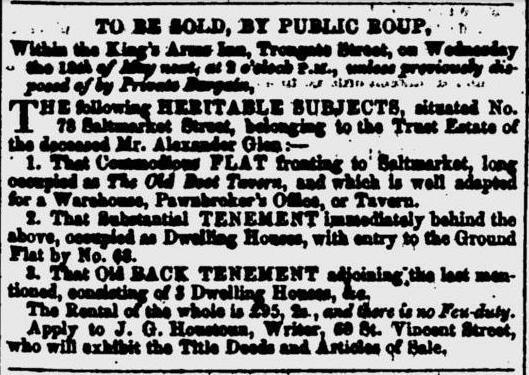 The following year an advert appeared in the Glasgow Herald of 21 February 1845 offering for sale "THE OLD BOOT TAVERN, BACK BUILDINGS, and VACANT GROUND in that Close, No 73 SALTMARKET STREET. Also that SHOP, No 38, BRUNSWICK PLACE, with Two Sunk Cellars; and Two and Three-fourth Shares of the GLASGOW and LONDON-DERRY STEAM PACKET CO., being the Trust Estate of the late Mr Alex Glen".. My understanding from Alexander's Will, was that these properties and shares were being held in Trust to provide an income for Margaret, should he predecease her, as was the case.. Therefore I would assume that the fact that it was being offered for sale may signify the demise of Margaret Glen, nee Paul. There is a record of an interment of a Margaret Paul, aged 65, in a lair in the Gorbals Cemetry on 14 February 1845 which may fit with the above. It would seem that the Old Boot was not initially sold following this advert but was re-let to a Mr Wilson as an advert for the letting of the Yorkshire Tavern at 78 Clyde Street appears in Glasgow Herald of 18 May 1846 - "apply to Mr. B. Wison, Old Boot Tavern, 78 Saltmarket Street." One would assume that this was Mr Wison formerly of the Yorkshire Tavern, having taken uo the lease of the Old Boot letting his previous establishment?s, with the final one appearing in the . There is a water colour by Alexander Shanks, depicting the Saltmarket of 1849. In the painting, in the right-hand foreground, is a tavern bearing the legend "William Innes - Vine Tavern". This tavern is listed in the Glasgow Directory of that year as being at 93 Saltmarket. 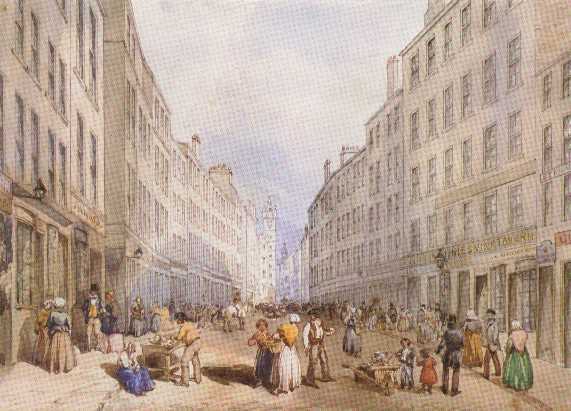 As the "Old Boot Tavern" owned by Alexander Glen was at 78 Saltmarket, it would seem logical that it would have occupied a site slightly further down the street, towards the Glasgow Cross, (depicted in the back-ground of the painting), possibly in the buildings in the left-hand side of the street, left middle-ground of the picture. In 1853 the Old Boot was once again offered for sale via an advert in the Glasgow Herald of 16 May 1853. This time it was finally sold as evinced by an advert in the Scottish Guardian of Friday 10 June 1853 reporting of it actually being sold - "exposed the upset price of £650, sold £7lO." 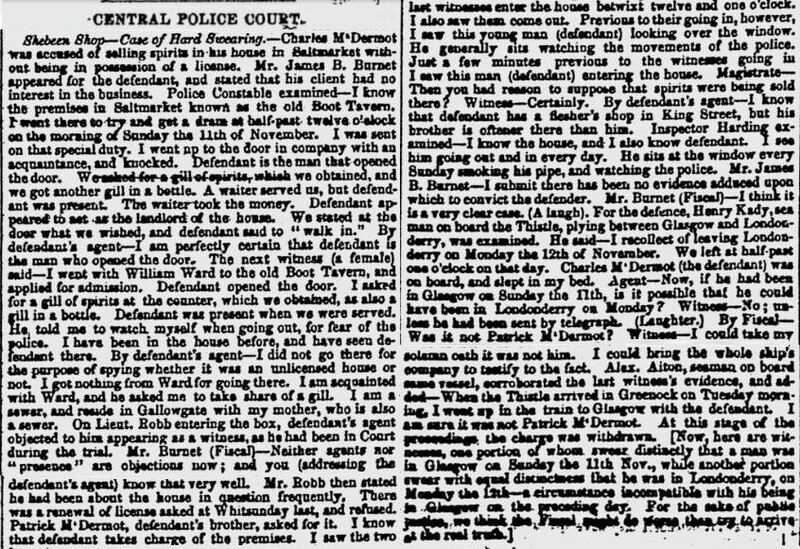 Two years later an article in the Glasow Herald of 22 November 1855 suggests that the Old Boot was still functioning as a drinking establishment but illegally so..! !